Some of the stars of this year’s Dundee Science Festival gathered in the city today (Wednesday 5 October 2016) to launch the programme which they hope will attract new audiences from every corner of Dundee. 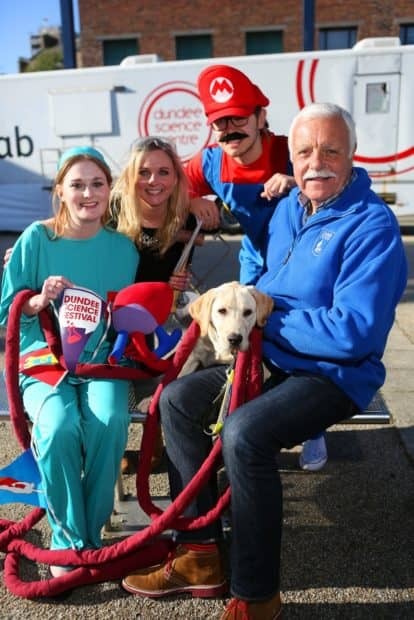 As the countdown begins, the festival programme was launched today by four of its ambassadors – ‘doctor’ Erskine, Guide Dog puppy Quip, local jeweller Scarlett Erskine and computer games character Mario. Once again, the emphasis will be on exciting and accessible events, with the majority taking place within Dundee Science Centre, community venues and shopping centres, not forgetting a standalone programme of events within primary schools. Three, themed family fun days run on each of the weekends throughout the festival – Medicine and Health, Animals and the Environment and Gaming and Digital Technology. Each weekend will be preceded by an associated and free Thursday night lecture by University of Dundee scientists, with dementia research, wildlife research and ‘Generation Tech’ being explored.